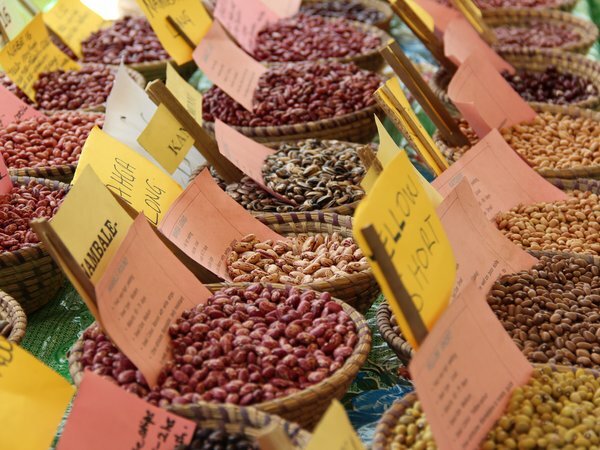 An estimated 1000 metric tons of assorted beans were sold daily in various markets around Uganda in the last week, according to Farmgain Africa Weekly Market Update. In Busia, yellow beans were preferred at Shs2,240 per kilogramme (kg) , Nambale beans at Shs2,024/kg , mixed beans from neighboring Rwanda at Shs1,480/kg , red beans at Shs1,590/kg kidney beans at Shs1,663/kg. In Kampala’s major markets, beans supply was good and yellow beans were bought at Shs2200-2400/kg depending on quality, long Nabe Nambale at Shs1900-2000/kg wholesale price, mixed beans from Kisoro, Kabale and neighboring Rwanda at Shs.1800-1850/kg, Masavu (Nabe) beans at Shs2100-2200/kg and Short (Nabe) Nambale beans at Shs1900-2000/kg wholesale price. Supply was mainly recorded from Ntungamo, Kyegegwa, Kagabi-Kibaale and Kkoki-Masaka. Less trading was registered for maize at Busia border market. Several traders were not doing business since it involves less capital to raise a substantial stock of maize grain, according to the Weekly Market Update. An estimated 30-50 metric tons of maize only were recorded traded on a daily basis. Grain prices have since declined from the previous week’s Shs.723/kg to Shs.697/kg. The least acceptable quality was bought at Shs.679/kg. The Kenyan market reflected a lower grain price than Busia border post price which is the main gate of Ugandan maize to Kenya. The Market Update says this situation is expected to continue until the first week of February when a better price is expected as a result of reduced supply of maize from within Kenya. The major grain markets in Kampala recorded a price declined due to increased maize supply to the market. Previously traders in Kampala offered Shs700/kg, however, with increased supply the market price declined to Shs.660-670/kg. “Speculators think the school opening week might have caused this increment in supply as parents search for school fees to return their children,” the Weekly Market Update says. Maize was received from Hoima, Kiboga, Kyanyanzi, Kyeggegwa, Kyangaali, Masindi, Kibaale and parts of Mubende. Apparently after the involvement of the army in the fisheries section on curbing down catching premature fish, the supply of mature and big fish has dramatically increased in several markets. In the major fish markets around Kampala, Tilapia that was offered in three grades, is now offered in one grade. The wholesale fish market operated in auction where bundles of five pieces weighing half each cost Shs4000-8000 depending on supply. The other grade consisted of 10 small fish weighing between 100-300grams at Shs10, 000-20,000 each bundle. The big size grade weighing 700 grams to 1 kilograms has been maintained. The tough regulation in the sector has rendered fish at reducing price per piece offered in Kampala’s major fish markets of Bwayise, Kireeka and Busega. Tilapia cost Shs4000-4500 per piece. Plenty of Nile Parch and Lung fish was delivered in the last few weeks rendering the market price lower. A kilo of Nile Parch cost Shs6, 000-6,500 compared to Shs9,000-10,000/kg during scarcity. Other commodities that were demanded from the Kenya traders included red sorghum at Shs795/kg, white sorghum at Shs723/, green grams at Shs2, 711-2,530/kg, cassava chips at Shs.686/kg, soya beans at Shs2241/kg, groundnuts at Shs3325/kg, and millet at Shs/kg. There was an increase in volumes of millet demanded at Busia border market to 300 metric tons daily. “Most of the traders who have a sizable capital have reverted to dealing beans at Busia. It was noted that since beans are more costly than maize, only those with more capital could afford trading,” the Market Update says.